Selecting a DJ for your wedding should not be a decision taken lightly. Over the years, we’ve heard countless stories from couples wherein a DJ with poor skills ruined their big day. Being a DJ is more than just ‘playing music’ – it takes years of practice to effectively read a crowd. Knowing when to play certain songs at specific times while taking requests from your guests, are all key to a successful evening. It is our goal to ensure everyone is having fun (whether on or off the dance floor), as well as keeping your dance floor busy! Before your big day, we will sit down with you and go over the itinerary for your evening. Some important details involving a DJ include selection & timing of music for the ceremonial ‘walk down the aisle’ + recessional / processional music, your entrance into the reception area, speeches, father-daughter dance, bouquet/garter toss, etc. We are always happy to provide you with references from past clients, and welcome you to come check us out at any of the ongoing weekly shows so you can gain a perspective of your DJ beforehand. 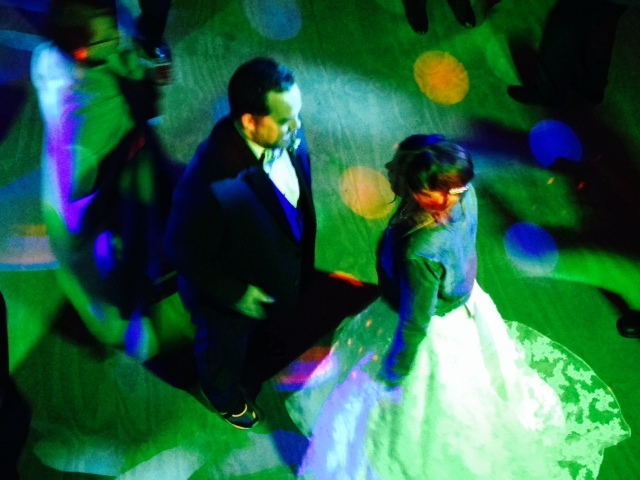 We also offer pictures and videos of previous weddings we’ve DJ’d for you to view. Because we are full time DJ’s – 7 days a week, (as opposed to most DJ’s who only perform on weekends and have a full time day job during the week), we are more able to keep current and up-to-date on the latest and greatest music hits! Not only are we constantly staying on top of the new and upcoming tracks, we’re also using our equipment regularly enough that we ensure everything is in working order and our back-up gear is also in check for any events. *Discounts applied with bundled services! We provide all Bride & Groom’s our standard DJ WEDDING FORM to fill out all the details of their special day (Please email us for a copy of our Wedding Form – scaraoke@me.com). We keep our pricing fair and always within your budget! If a potential DJ offers to do your wedding for a cheap price, chances are he’s probably inexperienced and looking to build his expertise at the expense of your special day. Don’t make the mistake of cutting wedding costs in this area; instead, allow our team to ensure the night ends with your dancing shoes coming off. At the end of the day, it’s always about you! Planning a Christmas Banquet, Buck & Doe / Jack n’ Jill, Corporate or Holiday Event, Grand Opening, Birthday Party, Anniversary, Backyard BBQ, School Dance? Over the years, our team of DJ’s have experienced several different types of parties & events. From themed costume parties to runway fashion shows – no occasion has ever been too great of a challenge. Our system is interchangeable between DJ’ing music & karaoke, so we can provide both options at any function. No location has ever been an issue either; from backyards, to living rooms, and even houseboats – we’ve got you covered! *For a copy of our standard DJ FORM, please email us at scaraoke@me.com – from this we can gather all the important details of your upcoming event! Karaoke has come a long way from the days of utilizing CD’s. Now, using powerful amplified equipment, lasers & lights, and advanced karaoke software, we can provide quick, uninterrupted queuing methods through computer streaming while all our legal music discs are kept in storage for protection. With over 50,000 songs to choose from, we are also connected with an online legal purchasing program which allows us to buy new songs within seconds for singers. No waiting weeks to sing your latest song! This program also has karaoke available in 50 different languages! Our software is interchangeable between karaoke & DJ music, so we can provide many options for your next party! What makes our karaoke shows different from other companies are foremost our interactive KJ’s (Karaoke Jockeys). Once the singer & music are tuned, we hit the floor and mingle with customers. Whether we’re helping them find their next song, encouraging them to dance, or simply asking them how their day went, we’re there to bring the energy and ensure everyone is having a good time in a positive environment! 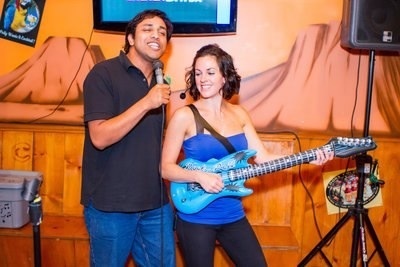 Similar to ‘Name That Tune’, Scaraoke Entertainment also provides Music Trivia Shows. Customers group together to compete for prizes by guessing the titles & artists of specific songs played throughout the evening. Bonus points are awarded to teams who participate in side games linked to the music. For a twist, we sometimes have guest appearances who will ‘sing’ the songs to each group competing – a rapper, beat-boxer, opera singer – not only making the atmosphere more fun, but challenging too! Don’t limit this form of entertainment to just bars & restaurants; we’ve done tons of private parties with a little music trivia thrown into the mix for extra fun! 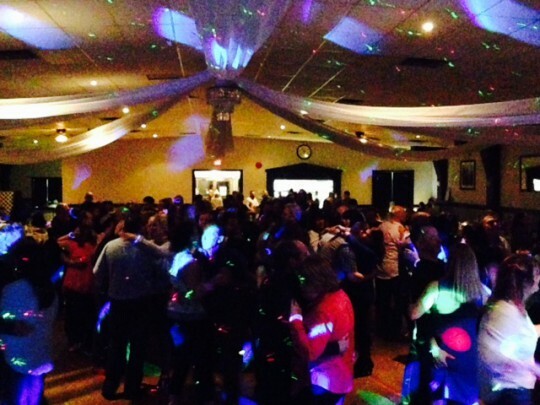 Whatever the occasion is, we’re here to provide your next function with more than just music! Scaraoke Entertainment prides itself on working well with all clients to achieve their final vision. If we need to hire performers or dancers, recommend a photographer or videographer, or provide suggestions for costume themed parties – we’ll do it! As DJ’s, we’ve encountered several different types of events, and have thus made all kinds of connections with partnering companies in the entertainment field. With a variety of options at your disposal, we’ll ensure you & your guests are thoroughly entertained! Or, if you just need a DJ – we can do that too!